Our June designer of the month is the extraordinary Kate Atherley. If you’ve ever wondered what a tech editor does and what makes a good knitting teacher, find out here from Kate. We’re welcoming back two designers we haven’t seen in a while with their new designs, Laura Chau and Kimberly Gintar. What Makes a Good Knitting Teacher? What’s a Tech Editor? What Makes a Good One? Confronted as we are by hotter weather, but still needing to knit, what does the enthusiast turn to? Certainly smaller, less demanding projects. Since my personal experience with knitting capelets and shawlettes is limited (while being a rabid fan), I've chosen to select baby cardigans this month. They are projects that hold a knitter's interest, are always useful as charitable gifts if you don't personally know a baby, and travel easily. Some of the designs have a size range that include kids up to 12 or thereabouts-- yay!-- but 'baby' was the prime criterion. Out of our current collection, I've restricted my choices to those designs which are for beginner to intermediate knitters, and which use only sport, DK, and worsted weight yarns-- all readily available no matter where in the world you are. At this writing, there are 716 to choose from. Here are some of my favorites. This Kim Hargreaves design for Rowan is an undisputed classic. One practical bonus is that if you knit a slightly larger chest size for your chosen age group, the sleeves will simply go from being full-length to 3/4 as the child grows-- always stylish and appropriate (for girls at least). Be as bold or subtle in your colour contrasts as you like-- everything will work. Some people fall in love with yarn more than a particular pattern. Others are willing slaves to architecture. This design is a dream for both. If you used a variegate, you'd get a marvellous kind of waistcoat effect because of the directionality. This was so immediately popular on its introduction that Vollick was persuaded to add a kids', and then an adult version. Handsome designs that would look well on boys and also make terrific use of variegates are thin on the ground. This piece from Anne Hanson is absolutely wonderful on every front-- including the option to make a vest instead of a jacket. And she writes an excellent pattern, too, both friendly and professional. I just love the integration of the bell edging with the neck/border treatment here-- everything's detailed but unfussy. And the overall look is just so gosh-darned pretty that any girl would find it irresistible. Add no-sewing to its top-down construction, and knitters will also find it irresistible. In which you demonstrate that your aesthetic is informed by tradition, but not dictated by it. Yes, this is an easy-to-knit V-neck cardigan (or vest, great for boys or girls), but it is utterly modern in its minimalism. This is a piece for the cool, the unconventional, the outliers, whether child or knitter-- you'll know who you (or they) are. And when you want a versatile, lovely, straightforward pattern to knit from again and again, can you do much better than this? Everything's plain st st except for the cardi fronts, which are beautiful and simple and would look great in most styles of yarn. If your finishing skills are less than perfect, the drop shoulder and flat sleeve tops make things that much easier for you. The yarn originally called for in this delightful pattern was a pure cashmere, which explains the simplicity of the body fabric-- who would want to tart up such a precious fibre? But since this is a bog-standard worsted gauge, these pieces would look fantastic in anything that knits at 5 sts to 1" (surely you have a favorite in mind). It's celebrating its first decade, but still looks fabulous-- this augurs well for all the decades to come. In case there was any question, these pieces refute, once and for all, any suggestion that crochet can be less elegant than knitting. Marvellous in any style of yarn, they are the sort of thing that makes your kid look like they were born into a trust fund, and that Eton or Harrow is pursuing them. The Chanel style of the jacket makes me think that they would be especially gorgeous in a tweed, but much experimentation is needed. When I looked at what I’d chosen for this month, I noticed that most of my choices just happened to be ones with lace, not difficult lace to be sure, but all accessories and garments with airy, yarn over stitches in them. That’s not surprising, I suppose, for this month. It’s nice to finally have days free from coats and jackets. Bonny by Emily Wessel of Tin Can Knits is a feminine summer piece, and flattering no matter what your size. The main photo is of a slight young woman, but be sure to see the same top on a fuller figure in the pattern slideshow pages. Bonny is knit in the round to the armhole split and may be knit in 10 sizes from 28” to 54”. You would not believe how easy this is to make. If you can count stitches and knit and purl, you can quite easily make this for the littlest sweet baby or her older sister. It’s two pieces, sleeves and back in one piece, the bottom in the other, both knit sideways. Pick a variegated yarn in favourite colours for maximum fun. This Sirdar cardigan is almost all lace, in the most basic of lace stitches called ‘fagoting’. This cardigan includes vertical stocking stitch panels to provide stability, but the basic stitch pattern is simple and speeds you along in a worsted weight yarn. The best thing you can say about T-shirts is - they are easy to wear. But definitely boring. I don’t imagine designer Jean Clement would call this a T-shirt, with its unusual sideways construction used for the bodice and sleeve, and the lace and cable border pattern. The shape is as easy to wear as a T-shirt but it has elegance; it’s anything but boring, and bonus! It's neither difficult nor boring to knit. I completely agree with Nazanin S. Fard: this is a Gorgeous Bolero. The back, fronts, and sleeves are knitted separately and seamed. The lace and garter edging is knit on, ensuring that it fits perfectly. It’s an excellent choice for a special summer event. The knitting adaptor in me wants to add the lace edging to the sleeve. Love it. Ash Kearns tells us the Saugeen Summer was designed on a canoe trip down the Saugeen River. You can make this hat in three sizes in your preferred cotton or linen yarn. Lace provides airy bits for ventilation while the doubled band is stable to shade your eyes. 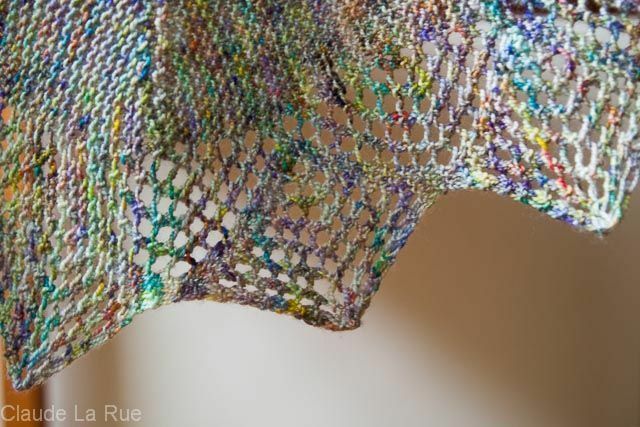 What are lace choices without a shawl? Not all shawl laces need to be complex, although I do love those. Knitting in the summer is not complex knitting time for me though. This Whitby Summer Wrap is the perfect coverup and a speedy knit with cotton DK weight yarn held double. In Mary Pat McDonald’s Mermaid’s Mantle, you’ll find images of her favourite things from the seashore but the real magic is in the pattern. Mary Pat teaches a “My Favourite Things” class, full of priceless knitting tips and she generously includes the applicable ones in this pattern. It’s always a lovely surprise when designers we haven’t seen in a while send us new patterns. Kimberly Gintar's Patternfish collection is almost exclusively shawls, plus one pretty pair of bed socks; her designs are all about comfort and friends. Yvonne’s Wings, her newest shawl, a top down Faroese, is named in honour of a test knitter who became a valued friend. She passed away. In Laura Chau’s cosmicpluto knits collection, you’ll find a pattern for just about anything you’d like to knit, from toys to fair isle mitts, baby sweaters to socks, scarves to hats, but mainly she’s a cardigan and shawl girl. Check out her Castlegar Cardigan and Wychwood Shawl. When we take knitting classes, we know when we have a good teacher. A very good one, Kate Atherley, has this to say about what she thinks makes a good one. A term we sometimes hear associated with pattern writing is ‘tech editor’. All the best pattern designers use them to ensure that the patterns you buy from them are the best they can be. Toronto, Ontario is hosting the 2014 World Pride Festival this month. Pride Toronto is one of the largest pride celebrations in the world, with an annual attendance of over 1.2 million people. Not only are courage, diversity, and history celebrated, but also the arts and culture of the community. The team at the Purple Purl, a Toronto yarn store, has is contributing to the celebration by creating a garter stitch rainbow bracelet festival bracelet to knit. If you like rainbows, Elise Duvekot’s Elf Garb is a fun hat and sweater pattern for kids. Crocheters might enjoy Sheila Zachariae’s Rainbow Ripple Blanket. It is a cliche to say that someone has it all, in any discipline, but Kate Atherley, Patternfish’s Designer of the Month for June, 2014, does have it all as a professional in the fibre industry. She is an exceptional teacher, a sought-after tech editor, an inspired designer, an author of two books, a writer with a unique and compelling voice, and a reliable resource. As a designer, I love that I can distribute my patterns digitally and leverage the power of the web to get my patterns out to a wide audience. The internet is a two way connection with knitters all over the world to educate, inform, and answer questions. If I find a mistake in a pattern – and it happens, no-one is perfect! – I can instantly update it, to ensure knitters are working from the correct version. As a teacher, I love that there are so many resources and references online and that I can create one if the need arises. The personal and personality-driven nature of online selling and marketing really suits me. Atherley identifies the sheer volume of resources as a weakness of the internet but also an opportunity for her. “When you’ve got 200 choices for a video to teach you the long-tail cast on, how do you know which one is going to be most helpful? And if you’ve got 200 patterns proclaiming to be the best “first sock” pattern, how do you know which one to choose?” The genesis of her book, Beyond Knit and Purl, was Atherley’s personal experience answering customer questions online. It mines her teacher and technical editor experience to help new knitters overcome the road blocks. We’ve all hit them. Twenty four patterns are specifically designed to practice new techniques. It takes commitment, passion, and discipline to become an established designer. What drove you in the beginning? What drives you now? I joke in my sock knitting classes that this entire career is down to the fact that I have small feet. I took up sock knitting in my mid 20s and started designing because many of the sock patterns I bought weren’t the right size for me. I had to figure out how to modify them to fit me and then I was off to the races! Two things motivate me: selfishness and selflessness. By selfishness, I mean that I design the things I want to knit, and to wear. Last year I designed the Rock ‘n’ Roll Collection - a set of accessories specifically to be knitted in black, because I wanted to wear a brightly-coloured coat with a black shawl and mitts. My next design project will be a Pi shawl, as I have been spending a lot of time with my lace stitch dictionaries, and I love the challenge of the mathematical nature of the design. And by selflessness, I mean that I want to help others. I took up knitting seriously in the mid-1990s – and it was both the best and worst possible time to do it. It was the worst possible time, as the craft was at its lowest point in North America. The yarn shops were closing, books and magazines were impossible to find, I couldn’t get my hands on good materials. And more personally, my grandmother, who was a very gifted knitter, had recently died. There was no-one to help me learn and grow my skills. Consequently, I made an awful lot of terrible and sometimes very silly mistakes. But the good news is that those mistakes have stayed with me – and they inform my teaching and my design. Many of my designs have the objective of helping knitters avoid those mistakes. I love the challenge of designing for new knitters, or for knitters who are new to a particular skill or technique. My first book, Beyond Knit and Purl, is all about learning new skills – working in the round, socks, cables, lace, colourwork – and I designed patterns for each skill that would allow a knitter to practise and get confident with the techniques, while producing something beautiful. You are a sought-after teacher and tech editor, as well as designer. How did your career branch off into these different areas? I started my knitting career as a teacher, and that’s very much informed the approach I take to designing and editing. I’ll never give up teaching, as I believe it keeps me honest as a pattern writer and tech editor. It keeps me in touch with the questions knitters have, it reminds of what knitters find easy, and what they find challenging. Looking at other designers’ patterns gives me an opportunity to see different ways to write instructions, and to see what works well and what doesn’t. How do you manage all these areas, switching gears from one to another? I need all three to make me successful! They all play together. I’m a better designer because of my teaching, I’m a better pattern writer because of my tech editing. I’m a better teacher because of own knitting experience. I like constantly switching gears – my best weeks are when I have a bit of all three activities. What are your best selling designs? There’s my Noro Entrelac. I’m a huge fan of Noro yarns, and I love coming up with new ways to work it. I teach a class on Entrelac, which I find endlessly amusing. No one believes me that it’s actually easier to work in the round than flat. Another best seller is my Top Down With a Difference V-Neck Vest. I love one-piece construction, but I find that a set-in sleeve fits me better than a raglan does. This vest is a quick-knit, and a terrific introduction to other types of top-down one-piece constructions. Another example of how I like to design to solve problems and to teach new techniques and skills. Which designs are your personal favourites? I’m always proudest of the design I’ve published most recently, (that’s Confetti Socks) but I think that the Heirloom Baby Bonnet will hold a place in my heart as the single most adorable thing I have ever designed. How do you think the knitting/crocheting/fibre world will change in the next 10 years? We’ll see crafters take on more, different sorts of crafts. Knitting leads to spinning; spinning often leads to weaving. Crochet leads to tatting. In the pre-internet days, if you took up a new hobby and got bored or frustrated, you were likely to give it up without further encouragement and support and inspiration. Now, thanks to blogs and discussion forums and Ravelry and online magazines and Twitter and Facebook, you can stay inspired and engaged. If you need help, you can get it. If you need ideas for your next project, you can get them. One of the ways it will change is that the internet will continue to grow, not shrink. And as knitters/crocheters try related fibre crafts, I think we’ll see more patterns that mix techniques – knitted pieces with crocheted edges, for example; embroidering as embellishment for knitting. How did you come to the decision to list your patterns with Patternfish? It was an easy decision for me! I loved what Patternfish was doing, and was keen to get listed. I saw Julia at a DKC event in Toronto. I approached her cautiously – at that time I was still very much a novice designer –I wanted to ask how to get listed, and what I needed to do, and how I might be able to eventually get enough of a portfolio of good work that I would be eligible. At the same time that I was moving towards Julia, she was moving towards me! She’d seen me, she’d recognized me – and wanted to ask me to list! Find all of Kate Atherely’s designs here. In May, we welcomed two new publishers. Jennifer Chase-Rappaport of RocketBoy Knits debuts at Patternfish with Purls and Seaweed, a cowl inspired by the seashore. The design has a rhythmic structure that’s easy to follow and memorize. Have a look at the Collection. It's so easy to imagine wearing these accessories and the fun of knitting them. Ravenswood Knit Designs is a co-op of four designers with over 150 years of combined knitting experience. The designs include accessories, baby garments, socks, and practically an entire closet of clothes for 18” dolls. Ravenswood’s debut pattern, the Hug Your Stuff Tote, is a shaped, textured, felted bag in a welcome vertical orientation. Sleeveless knits can be warm weather tops or cool weather vests depending on the yarn and fit. Here are some choices. My favourite Kate Atherley pattern is Asking for Flowers. I love it, from its delicate lacey Shetland edging to the short rows that give it a curved shape. I enjoy patterns that begin with the trickiest bits and then get easier and faster like this one. It's fun, too, because you just keep knitting until there's nothing left to knit. And then you're done.